» home » enterprise zones » » are digital technologies for everyone? Are Digital Technologies for Everyone? Cindy Jutras, an expert in analyzing the impact of enterprise applications on business performance, is president of Mint Jutras, LLC, Windham, NH: 603/434-9688; www.mintjutras.com. Industry pundits have been hyping digital transformation and digital technologies for several years. This hype tends to make ample reference to consumer technologies such as connected homes, self-driving cars and wearable fitness devices. More challenging is connecting this transformation to the workplace and the enterprise in a way that brings real value. The pundits assume that these technologies are well understood and perceived as valuable. But are they? I don’t make any such assumptions. And, my annual enterprise-solution study conducted last year on digital preparedness confirms that many decisionmakers in manufacturing are fooling themselves with a false sense of security. 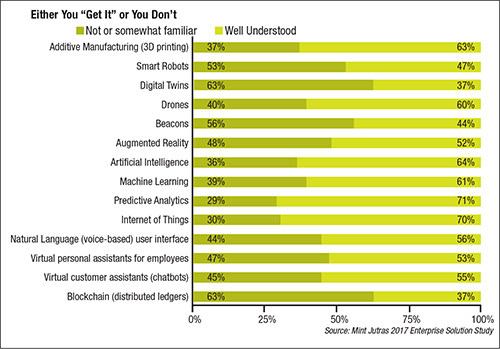 While 88 percent of those that took my 2016 survey agree that embracing digital technologies is necessary for survival, the majority still rely, at least in part, on spreadsheets for something as common as recording business transactions. That contradiction led me to investigate, most recently, just how well understood various technologies are, and whether value is perceived as real. While still collecting data from our 2017 Enterprise Solution study, we can make some early observations (see the table above). Participants represent a range of industries and company size, from small to very large. 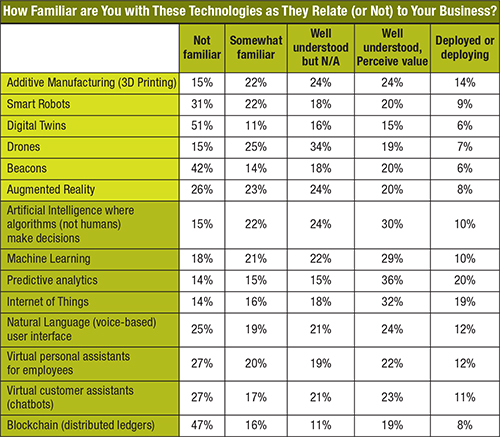 We asked respondents to assess their level of familiarity with 14 different kinds of technology, and indicate how the technologies relate (or not) to their businesses. All respondents were asked about all 14, even though we realize that some are more relevant to some industries than to others. Those shaded light green primarily apply to those making and/or moving a physical product, while those in dark green are likely to be applied more universally. One way to analyze the data is to divide participants into two groups—those with no or limited familiarity with a technology, and those that understand it well (Fig. 1). 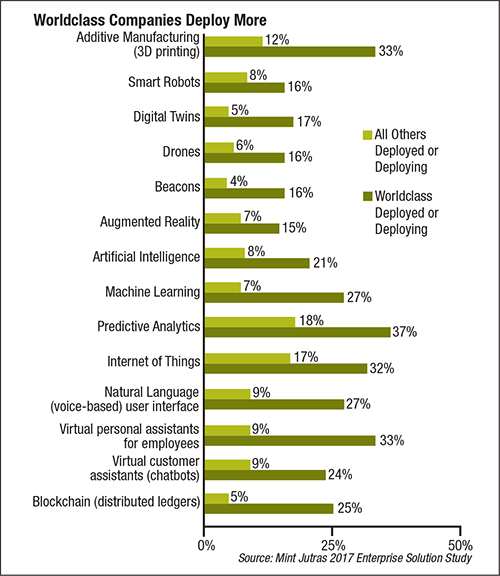 We presume that those who have deployed or are deploying a technology fall into the latter category. We seem to be all over the map here, with those that understand a technology well most often utilizing increasingly large volumes of data to provide intelligence. And yet, we don’t see a big uptick in terms of deployment (Fig. 2). 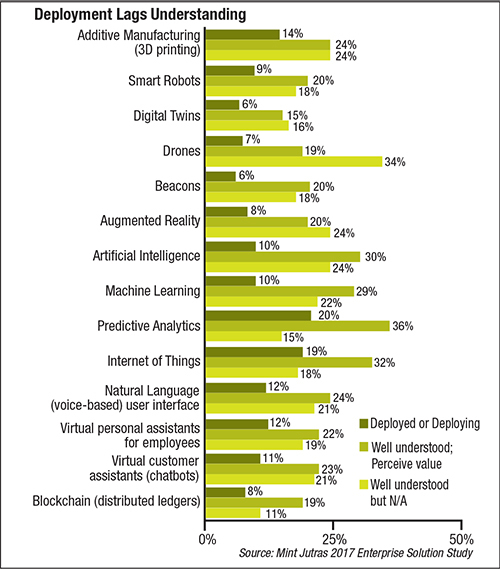 Only 10 to 20 percent have even begun to deploy the technologies that are most well understood, and many do not see the applicability to their businesses. Is this due to a lack of education, or is it because these technologies really don’t apply? I think it is a little of both. While I plan to do a deeper dive by industry, two preliminary data cuts tell me a lot. First, companies that fall into my category of “worldclass” users of technology (the top 15 percent) have a far greater knowledge and appreciation, and adoption rate, for these technologies (Fig. 3). Note: Better use of technology often correlates with better company performance, in terms of growth and profits. So, we’re not surprised to see a higher level of understanding and adoption at companies that have achieved worldclass status. We also recognize that while deployment is about the company, understanding and perception of value is more about the individual. And this is where the second data cut proves quite revealing. I looked at levels of understanding based on the age of the survey participants, the vast majority of which fell into the categories of baby boomers (23 percent), gen Xers (53 percent) and millennials (23 percent). Not surprisingly, the level of understanding of these technologies is inversely proportional to age (Fig. 4). In terms of seeing the value of new technologies, baby boomers are definitely harder to convince. As a baby boomer myself, I am skeptical of technology that can make us lazy. Smart refrigerators are the perfect example. Do we really need a mobile app to manage the inventory of our refrigerators? The risk, however, that we face with such an attitude is overlooking some new technology that can make a significant, positive impact on our businesses. Likewise, early adopters of new technologies face the risk of investing too much for too little real value, while also becoming lazy.